UDM Downloads > PDF Converter Ultimate! 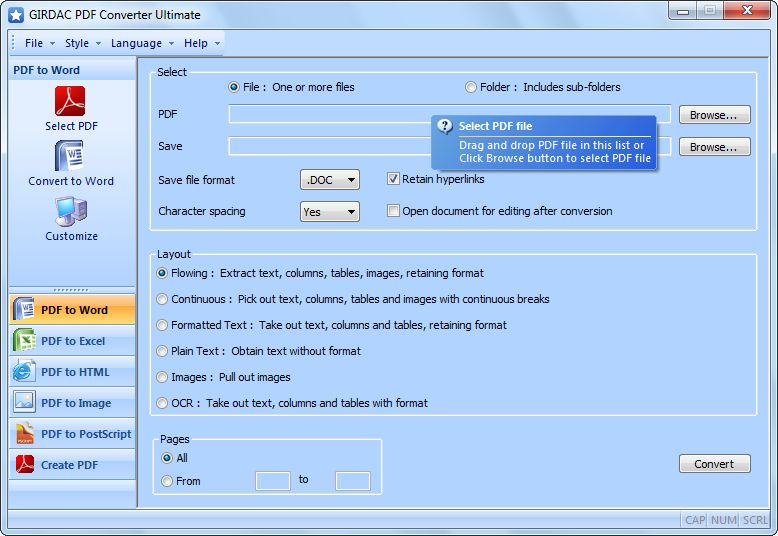 GIRDAC PDF Converter Ultimate is a software application for converting PDF documents to Microsoft Word , Excel, HTML and over 100 image formats, and plain text file. It extracts images from PDF documents. It also creates PDF documents from any printable file. It converts PDF documents with six Layout options: (a) Flowing: Converts PDF documents retaining the format with text, columns, tables and images. (b) Continuous: Converts PDF documents picking out text, columns, tables and images with continuous breaks. (c) Formatted text: Converts PDF documents retaining the format and text, discarding images. (d) Plain text: Converts PDF documents by extracting text without format. (e) Images: Converts PDF documents by picking images only. (f) OCR: Converts scanned PDF documents through OCR. It supports 60 user interface languages: Afrikaans, Albanian, Arabic, Armenian, Belarusian, Bulgarian, Catalan, Chinese, Chinese Simple, Croatian, Czech, Danish, Dutch, English, Esperanto, Estonian, Finnish, French, Galician, German, Greek, Hebrew, Hindi, Hungarian, Icelandic, Indonesian, Irish, Italian, Japanese, Kannada, Korean, Latin, Latvian, Lithuanian, Macedonian, Malay, Maltese, Norwegian, Papiamentu, Pashto, Persian, Polish, Portuguese, Romanian, Russian, Serbian, Slovak, Slovenian, Spanish, Swahili, Swedish, Telugu, Thai, Turkish, Ukrainian Urdu, Vietnamese, Welsh and Yiddish. It provides four User Interface styles: Windows 7 Blue, Black, Aqua and Silver. Its trial version converts up to three pages for forty PDF files. It supports Windows 32-bit and 64-bit operating systems.